In the comments, Joe Leider points to this economist article and Chuck E. points to this article. Both articles are discussing this paper (pdf) from Matthew Rognlie at MIT that is a response to Picketty's recent work. One of the points he makes is that the growing share of income going to capital has been going to homeowners, not to corporate owners. Here is a graph from Chuck's medium.com article. I made the same point in this series of three posts. Rognlie obviously tackles the issue with much more depth and quantitative analysis. Here is a recent post where I looked at capital allocations and incomes. Here are two posts where I addressed the issue of housing and Picketty. Sorry for all the self-references, but I've been kicking around these ideas about the interplay between corporate capital, housing capital, and human capital. Maybe I'm repeating myself, but I think there is an interesting long-term issue to consider here. I was trying to excerpt from the two posts in reaction to Picketty, but I'm finding it difficult. I normally don't do this, but I think I need to introduce these two posts, in their entirety, as a preface to this post. If you are put off by the intemperate post titles, please forgive me. I think you may find something edifying there if you read them both to the end in spite of my rhetorical excesses. This current series of posts, which has busted through the cattle gates around the original topic I was considering, started as a sort of work in progress to estimate the effect of tax policies on incomes and home prices. I haven't finished that yet because of all the tangents like this one. But, an interesting issue, highlighted by Rognlie, is that there has been a significant increase in housing consumption, across nations and across time. There is a lot going on here outside of tax policy. In the two posts highlighted above, I play with the idea that the defining character of this era, the dark matter of economics, is human capital. Even much of what ends up as traded capital in the tech. economy comes from human capital. The ownership stakes of Silicon Valley founders and early stage employees are not the product of capital investments as we normally think of them. They are the product of highly variable outcomes resulting from serendipity, skill, innovation, and coordination - explosions of human capital in a world that is still in the adolescence of a technological revolution. Human capital has the problem of being very illiquid. Human capital development is constrained by individual idiosyncrasies and cannot be easily diversified. This is the source of much of the current variability in wealth and income. The disappointing thing about the debates that came out of Picketty's work is that they seem to be focused on returns to physical capital. This makes for a much more politically predictable framing of the debate at the expense of missing the truth of the matter. There isn't a constituency out there dying to hear that taxing education might mitigate inequality more effectively than taxing corporate earnings. So, in some ways, human capital today carries some of the characteristics of pre-industrial capital, where landed elites captured very high profits, but were tied to their property. But, today's human capital comes from a much less stable context. While the earnings of a given individual may be inherited, the capital itself cannot be handed down through generations. So, we all fumble our way through our productive lives, and every once in a while - Shazam! - a Jeff Bezos combines tremendous skill, hard work, cooperation, and serendipity, and suddenly owns a massive expanse of digital real estate. Jeff Bezos is an outlier, although these outliers, together, are a good part of the vaguely unpopular 1%. But, across the economy, for every Jeff Bezos, there are a hundred thousand engineers, computer programmers, middle managers, etc. who are playing smaller roles in this same drama. We are the sole owners of the collected value of our individual experiences, training, and skill. There is limited potential to diversify and share this value, which is a shame, because, as with modern public corporations, this would add real value. We would be wealthier for it. In fact, some forms of income redistribution could be seen as a sort of planned diversification of human capital. In that way, some forms of redistribution or access to skill development could be seen as public goods - providing added aggregate value by reducing the discount rate applied to the future returns from human capital. For those not used to thinking this way, this might seem like financial hocus-pocus. But, just as with publicly traded corporations, this represents real value. The liquidity premium is, in the end, tangible. One way in which human capital can be traded is through real estate transactions. In the "Part 2" link above, I show a brief outline of how the value of human capital might look over the course of a single life. The conventions we have around real estate ownership create a sort of arbitrage opportunity with our future selves. We might think of the mortgage banker as an intermediary between our current and future selves. When we purchase a home, the home happens to provide a stable source of collateral on which to build the transaction. (This is the problem with student loans. They are also an arbitrage with our expected future human capital, but since students lack the ability to take a token position in a stable piece of collateral, the transaction cannot be established.) The use of nominal, amortized debt to buy the house is basically a way in which the home buyer can contract her future returns on human capital to her current self. The mortgage is, in effect, a measure of some portion of unrealized human capital gains, and home equity grows out of a combination of realized human capital gains and realized capital gains on the real estate itself. In these ways, human capital is transformed into both "physical" capital (although much of this is in the form on intangible corporate assets or market values) and real estate capital. So far, I have mostly been repeating myself, and I have probably gone on too long. But, I think there may be additional ramifications here. Jeff Bezos has a way to diversify the unrealized gains from his human capital. He took it public, along with some other capital, under the ticker symbol AMZN. Most of us don't have this option. For most of us, the only viable outlet for diversifying our human capital is this real estate time arbitrage. Diversification has real benefits. Liquidity is wealth creation. This means that housing adds value, not just as current consumption, but as a sort of holistic portfolio management. 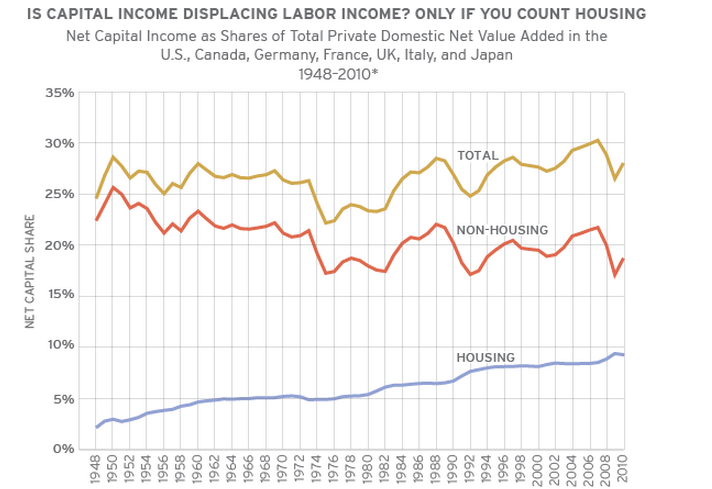 So, the growth in the nominal value of housing stock might give us a window into the growing value of human capital. And, within that gross value, we can think of mortgages as a window into the value of unearned future expected profits from human capital. I have been discussing this, mainly as a comment on the idea of capital's share of income, and how this may be an important factor to consider. But in addition to housing being a reflection of this human capital, I think there may be the additional issue of causation. This value might be causing housing consumption to be inflated, relative to what we might otherwise see. Households would bid up rents in the process of creating real estate assets that can serve this function. Also, this large pool of capital that is high return/high risk, would move households to adjust the other portions of their capital holdings to include more low risk assets (treasuries, debt, and real estate). We might think of someone who is the steward of the assets of a family that owns a valuable, privately held business. Those types of investors, referred to in the finance biz as a Family Office, are notoriously risk averse. In finance theory, one cannot expect to earn profits from non-diversified holdings. But, that only applies to holdings that can be diversified. Holdings that cannot be brought into the market basket of goods tend to earn a premium on the non-diversifiable profits. As incomes rise, and education, skill, and serendipity become more important factors in lifetime incomes, households across the income spectrum are holding larger and larger proportions of this dark matter capital. Our portfolios are brimming with this high return, high risk, non-diversifiable asset. We need to diversify the rest of our portfolio (our physical capital and real estate) with low risk investments. Possibly, as incomes move ever higher as productivity and innovation continue their upward march, we will inevitably demand low risk assets. This means lower yields on treasuries, more houses, and higher price/rent ratios on those houses. I think this may explain, particularly, the especially high home prices - both in rents and in price/rent ratios - in places like Silicon Valley. That is ground zero in the explosion of human capital, both earned and unearned. The high cost of housing in areas like Silicon Valley is frequently blamed on zoning restrictions. But, I wonder if, to a certain extent, the localized inflation of rents and home prices is an inevitable result of this human capital time arbitrage. Outstanding blogging Kevin, simply outstanding! I think you've nailed the crux this whole "inequality" discussion. Each of us possess different human capital. We all make choices to trade that capital for a wide variety of other assets.